IE SHIMA, Okinawa, Japan — Marines with 3rd Marine Logistics Group and 3rd Force Reconnaissance Team dropped a Polaris MRZR4-900, a gas-powered combat vehicle, for the first time May 22, 2018, on Ie Shima Island, Okinawa, Japan, as part of regularly scheduled training. According to Lt. Col. Matthew Mulvey, commanding officer of 3rd Transportation Support Battalion, the training validated the effectiveness of the rigging platform for the Polaris MRZR and trained the unit on safe and proper ways to handle the equipment. The Polaris MRZR offers an agile off-road design that can be used for missions ranging from rapid personnel deployment to command and control and casualty evacuation to supply transport missions. During the training, Marines with 3rd Transportation Support Battalion, Combat Logistics Regiment 3, worked alongside Marines with 3rd FRT, 3rd Reconnaissance Battalion, 3rd Marine Division, III Marine Expeditionary Force. 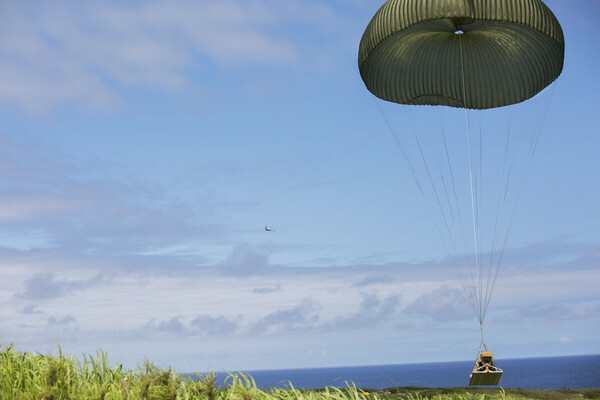 Landing Support Company, 3rd TSB, is the only III MEF unit that maintains a large-scale air drop capability. It has the ability to deliver heavy equipment, as well as vehicles and pallets weighing over 4000 pounds, in garrison and combat environments. The parachutes used to conduct the cargo drops were designed with holes to reduce time in the air and to land accurately in the drop zone. Regular parachutes delay the time it takes for an asset to reach the ground, because they don’t allow for smooth air flow during the landing process. The main purpose of the modified parachutes is to augment deployed units in areas that may have enemy forces nearby. The drop zones used for the training were specifically chosen based on surveys that are conducted every five years. The surveys ensure that the zone is sufficient in size and free of hazards affecting the Marines or the surrounding community. One of the missions of the training was to test the unit’s ability to accurately drop the MRZR from a KC-130 and assess the vehicle after it landed. After dropping the MRZR, 3rd TSB Marines jumped from the KC-130 on a static line at 700 feet and later conducted high altitude free-falls from 13,000 feet. “It was a great learning opportunity for our [Marines],” said Sgt. Brenden Tuxbury, a jump master and air delivery specialist with 3rd TSB. Tuxbury said the Marines enjoyed every second they got to jump through the sky and train. Mulvey said his Marines really appreciate the Japanese government for allowing the units to conduct the tests on the island of Ie Shima. “It’s one of the only areas that the unit can get to in a short amount of time and practice the procedures that allow us to fight tonight and win,” said Mulvey.